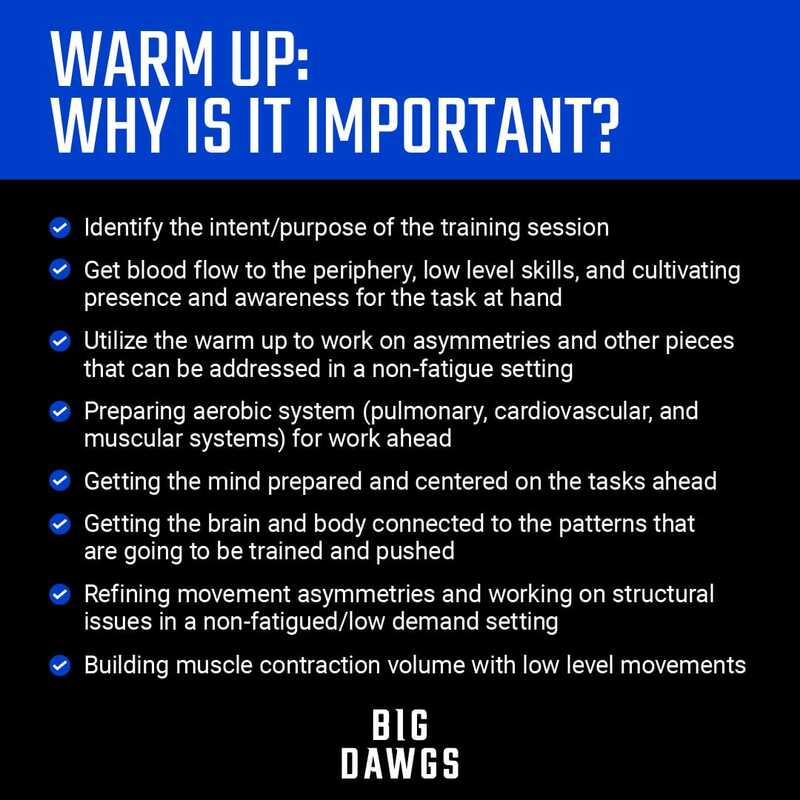 Big Dawgs | Warm ups: Why are they important? Nothing intense or overly taxing; want to feel good and ready for the work ahead (if we get into intensive work within the warm up we can start to utilize improper fueling mechanisms that will pull away from the intent of the training. In this piece, we are focusing on blood flow to the periphery through cyclical and bodyweight patterns. The intent is to open up the body, allow for acceptance of more blood flow, feel free, no restrictions, and ready to breathe. In this piece, we are still focusing on blood flow to the periphery through cyclical and bodyweight patterns. There are more complex movements within this warm up piece as they replicate the test for the session. But the context is very different. This is followed with some preparation pieces that are preparing the system to utilize additional fuel sources for the test. The intent of these pieces is to increase pace each set to slowly expose the system to the pace you want to maintain, if not slightly faster, when it comes time to do the test. This is also increasing confidence, awareness, and presence on the task at hand. The brain and body know what is coming. There are no secrets.